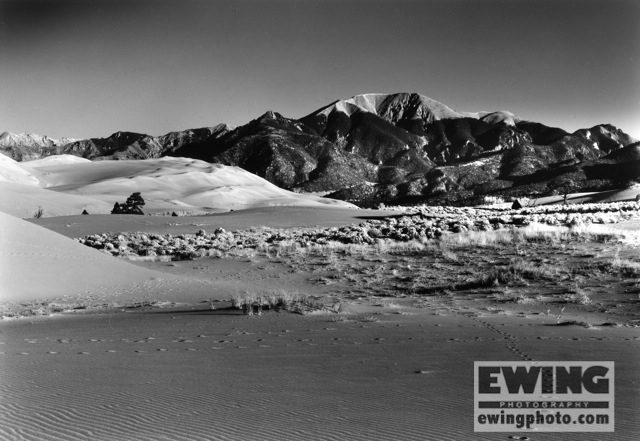 On my way to Taos, New Mexico to pick up prints from a show last winter, I stopped by Great Sand Dunes National Park – a favorite location of mine for shooting black and white landscape photography. I photographed Mt. Herard one morning back in 1990 and got an inkling to find that spot again, 24 years later. Life on the road in my Sportsmobile. I set up camp in my trusty Sportsmobile and ventured out into the dunes that evening with my medium format camera and not a soul around for miles. The park is bustling in the summer with families and tourists from all over but tends to be stark empty for much of the winter as they close a significant portion of it for the season. The evening light coming across the dunes with the Sangre de Cristos in the background I set out to capture what I could before I lost it to darkness. That evening I pulled up the image from 1990 on my laptop and snapped it with my iPhone. The next morning I set out to locate it, being that when the image was originally taken GPS locating was not as common as it is today. You would be hard-pressed to find them in use, back then, by anybody besides the military. That said, I've made so many prints of that image over the years I knew the details of the landscape by heart. My only fear was the shifting sands over 24 years may have changed so drastically the landscape that I would not be able to find the location. I lined up landforms to the mountain in the distance – Mt. Herard. To my surprise and excitement, the land had not changed as much as I thought and I was able to find the spot. This time I geo-located it with my phone and headed back to the van. I drove out to Taos later that morning to pick up my prints and then turned right back around to Great Sand Dunes National Park to shoot the evening light with my Deardorff 5X7. Now that I knew where to go, I set up my equipment and shot from that exact point just as I did 24 years earlier. That evening I enjoyed a glass of wine surrounded by the quiet and mountains still amazed that so much of the land was the same after all this time. Early the next morning I headed out to capture the same spot, this time with the morning light painting a different picture and beautiful all the same. I am planning to make more trips out the sand dunes in the months ahead to continue capturing moments of slow change among such an amazing landscape. You can purchase the images of Mt. Herard as the January Print of The Month, taken from my most recent trip to that old spot I first photographed 24 years ago.